Synopsis: “What if you aren’t the Chosen One? 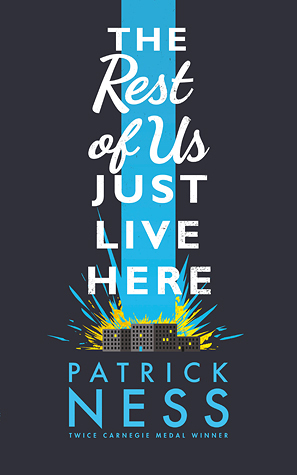 The Rest of Us Just Live Here is my first Patrick Ness novel, but I now understand why everyone is in love with his writing. Ness has created a world that I’ve never even thought about before; it’s so simple, yet so creative. Of course, the biggest part of this story revolves around the world the characters live in — a semi-contemporary place where the characters are aware that the ‘chosen ones’ (aka speshul snowflakes) live amongst them. These people are known as the ‘indie kids’, the ones that wreck havoc around them while attempting to save the world. Mikey, the main character, and his friends exist in this same world, are affected by their actions, but in all essence live simple lives weighed down by their own life problems. I cannot put into words just how cool this world Ness has created actually is. I’m a huge fan of high fantasy where 80% of the story is built on good world-building, but the simplicity of TRoUJLH truly blows me away. It really just works. The book follows the lives of Mikey, his sister and two of their closest friends. The plot reads as a contemporary, touching base on many of the problems that are experienced by Mikey and his friends. They’re normal problems involving growing up, dating, family and school — and when juxtaposed next to the problems the indie kids are being faced with while attempting to save the world — it truly makes you question why can’t the problems faced by each respective party be in the same league? Does one problem really take precedence over the other? Aren’t they all just as important, with importance determined by the person that is experiencing the problem, rather than a third party looking on? While Mikey and his gang are considered quite normal in comparison to the indie kids, they each have their own quirks that set them apart. Mikey has OCD, his sister is recovering from anorexia, his crush is going on a mission tour in Africa and his gay best friend is a demi-god of some sort…worshipped by cats. It’s such a very, very odd book — and I admit that I got very confused when I first started reading it. The concept and world takes some getting used to, and while there are some action, don’t expect it to take centre-stage because this novel is very much a book about people; relationships, family, how people go about their lives really. But that’s simplifying it a lot. Thank you to Walker Books Australia for providing an ARC in exchange for an honest review.